With the big day at hand, I awoke around 3:30 am (alarm was set for 4:00) and began preparing, with my usual pre-race breakfast of oatmeal with milk, a cup of cappuccino, and a banana-blueberry smoothie. I was out of the house at 5:30 and on the 6:00 am MARTA train from Doraville. The excitement of the runners was palpable as we boarded the trains, and even more so three stops later, when the runners packed the escalator at Lenox Station. 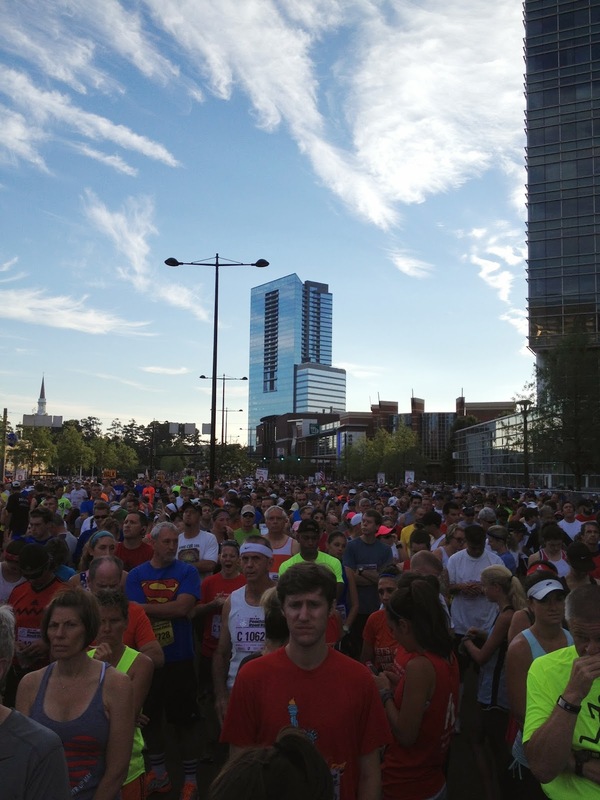 Lenox Road was closed to automobile traffic, and hundreds of prospective runners were already walking to the starting area. After finding my way to corral C by 6:30 am, I decided to walk around a bit and take some photos, and on my way to take a photo of the starting line, I saw my coaches Curt and Kathie Walker. This year we were quite fortunate with the weather: thanks to a hurricane on the outer banks of North Carolina, the hot air had been vacuumed out of the southeast and the temperature was quite pleasant, 63 deg F at the start, and mostly clear skies with only a few light clouds. This is about as cool as it gets in Atlanta in July. With the excellent conditions, I hope that the elite runners will set some course records today! And I feel good about my own prospects for a good race. 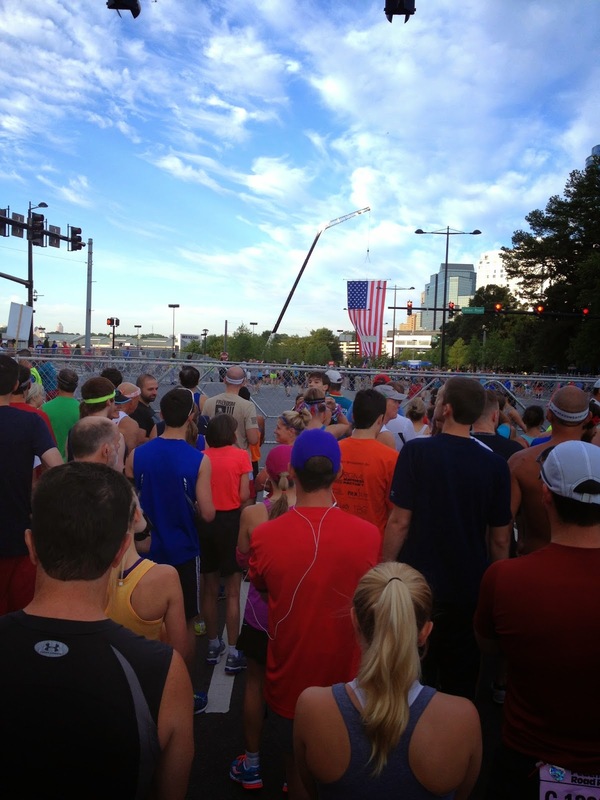 Incredibly great weather for the start of the Peachtree Road Race! My strategy for today's race evolved in the course of the week. I decided to break the race into two 5K races: the first 5K, with mostly level and downhill sections, would probably be the easiest 5K that I've ever run, whereas the second 5K, with the first two miles uphill, would undoubtably be the toughest 5K. My goal was to stay with the middle of the pack for the first 5K or 3 miles, not aiming to pass people, and just have a comfortable jog, letting the other runners in wave C carry me along. Then upon reaching the hills in miles 4 and 5, focus on form and take my time going uphill if I needed it. The point was to have a decent reserve of energy for the last mile, and hopefully even a burst of speed in the homestretch. And a much larger group of runners behind. As the clock passed 7:00 am, corral C quickly began to fill. I took a spot about 25 feet from the front of the corral, and warmed up in place while waiting for the start. 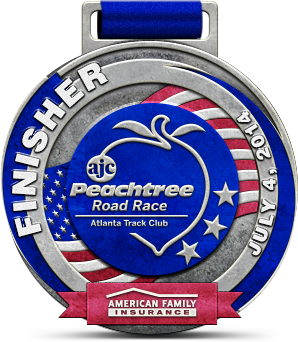 While I was waiting, I felt a twinge of sadness that I had lived in Atlanta for over 15 years, yet I had never before participated in the Peachtree Road Race, not even as a spectator. I had let my fitness level drop quite badly over those years, until getting back in shape over the past year. But I pushed that negative thought aside with the mantra "Better late than never!" At 7:30 sharp, we heard the announcement of the elite runners beginning their race, followed by subseeded runners and wave A. As wave B moved up to the starting line, the fence blocking the front of our corral was removed. The buzz of excitement in our group increased, as we were soon to be released! It was ironic to feel an impending sense of freedom as we headed for the US flag in front of us, in our celebration of Independence Day! After another couple of moments, the corral official gave permission to WALK the block to the starting line. After walking a few dozen steps, everyone began jogging to the start line, we were all so excited to begin! The announcer picked up on our energy, although I don't recall exactly what he said, but something like "Wave C can't wait to begin!" The seconds ticked down quickly to 7:40:00 am, and the wave C runners were given the signal to start! 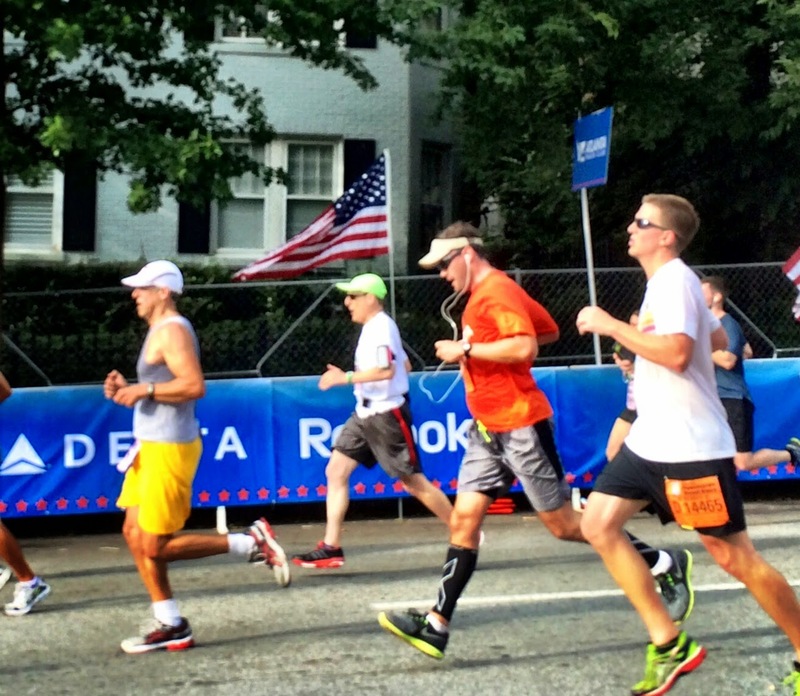 As I crossed the starting line, it sank in: Finally, I am now running my first Peachtree Road Race! 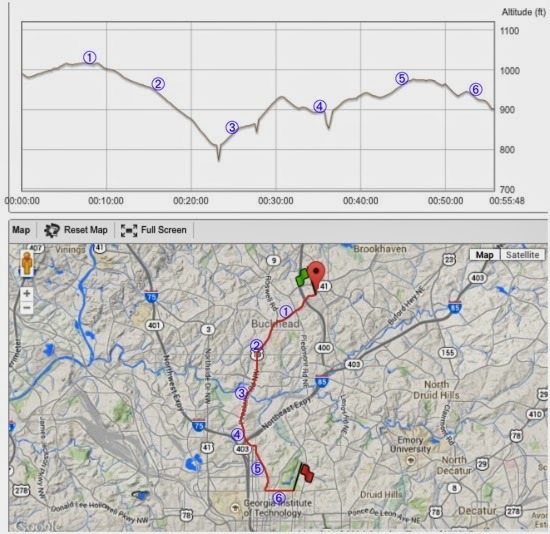 Elevation profile and route map completed, with approximate mile markers on both maps. The downward spikes on the elevation map are artifacts from running over two bridges and the overpass at I-85. The GPS apparently recorded the elevation of the lower level, possibly from a topographic map. Mile 1: I started out in the middle of the left lane, and managed to stay away from the medians throughout the starting mile. Wave C was the right wave for me, even though I had only one time that qualified me. I had no trouble keeping up with the runners around me. The large number of runners was not a problem given the width of the road (six lanes), and with everyone at a similar pace, the crowd was not holding me back. But to conserve energy, I held back from deliberately passing people, even though I felt that I could run faster, but remembering that mile 1 of a 10K was only the warmup. It was really fun to run past familiar landmarks in the first mile from the middle of the road, including the Mandarin Oriental Hotel and Bistro Niko. I had read that most fans would be at the end, but was pleasantly surprised to see plenty of spectators cheering us on at the start. There were also a couple of bands playing upbeat music before we reached Piedmont Road. Unfortunately as I neared the mile 1 sign, my left shoelace came untied! I worked my way to the left of the road, pulled off to tie up quickly and resumed pace as quickly as possible. With the cheering crowds and the sounds of my fellow runners, I could not hear the alerts from my tracking program, but I felt that I was running a proper pace. When I checked afterwards, I had covered mile 1 in 8:01. Mile 2: We proceeded through the intersection with Roswell Road and East Paces Ferry, as the road began perceptibly downhill. Everyone was running pretty easily. Occasionally another runner would dash by quickly but I didn't let it bother me, as I continued to keep pace with the crest of the wave. Wave B had a five-minute headstart on us, so there was apparently still a clear gap between our waves. When I heard a sideline announcer call out "Here comes wave C" I realized that I was still near the front of the wave! As we worked our way towards the intersection with Wesley Road, known as "Jesus Junction" due to the proximity of three large Christian churches within a couple of blocks, I saw the famous holy water spray on the right side. Mile 2 was completed at 16:20, 8:19 for that mile. Mile 3: The downhill slope increased even more in this section, but not uncomfortably so. I realized that I was probably on a personal record pace for a 5K. I was just enjoying the thrill of hearing the spectators cheering for runners. We passed the metro-Atlanta population sign (now 6.2 million), sailed past the intersection with Lindbergh Road, and were quickly at the Peachtree Battle shopping center. Then I could see the bottom at Peachtree Creek, and the beginning of Cardiac Hill. A century ago, Peachtree Creek was a northern boundary of Atlanta, and during the Civil War, it was apparently the last natural barrier protecting the town of Atlanta, hence the name "Peachtree Battle" for a street and a shopping center just north of the creek. We started uphill and I could definitely feel myself slowing down. A band was playing Cuban music. They were quite good, but why were they playing in a minor key? I thought, why not a happy major key to encourage us as we started uphill?! Mile 3 was completed a few hundred feet south of Peachtree Creek, at 24:33, 8:13 for that mile. at the top of Cardiac Hill. Photo taken on July 5. Mile 4: As I began working my way up Cardiac Hill, that pesky left shoelace came untied, again! I must find a better knot before my next race! The "Ian Knot" was clearly not reliable (or I wasn't tying it properly). But to find a safe place to pull off to retie the shoe, I first had to get past the free beer stand, which was quite popular. This time I tied the regular knot that I learned in kindergarten, as it had mostly worked for me with only a couple of exceptions for 46 years. Quite a few runners passed me or pulled ahead as I worked my way up the hill, but I just focused on standing tall, picking up my knees, breathing in-and-out in a six-step cadence, and pumping my arms. All of that helped, but unfortunately I began to notice a possible blister developing on the ball of my left foot. The pain wasn't too bad, and I felt that it wouldn't adversely affect me for the remaining miles, but something to work on avoiding as I take on longer distances. 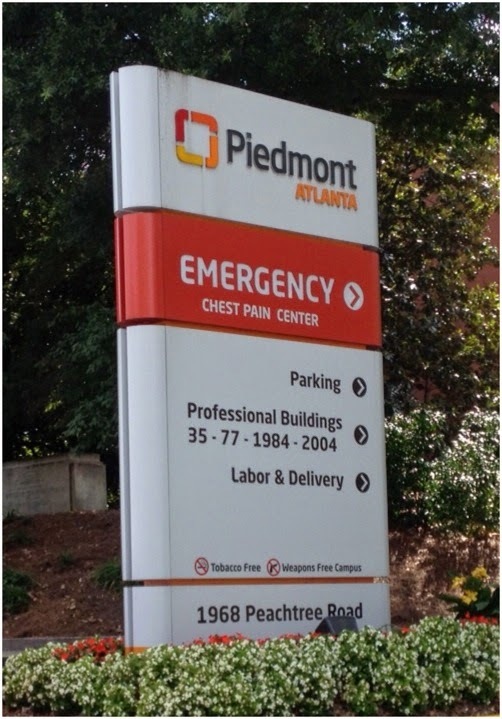 It didn't seem to take too terribly long to reach Piedmont Hospital, and I noticed the signs for the "Chest Pain" center at the top of the hill. I was tempted to slow down and take a photo of the "Chest Pain" sign, but decided that I was more interested in trying for my best time, so ran past. The road leveled out - actually the elevation map showed it as downhill, although it wasn't perceptible to me - and I completed Mile 4 at 34:20. 9:47 for the critical fourth mile, a time that would have delighted me if I had known it at that moment. Mile 5: Shortly after beginning mile 5, we crossed Interstate Highway 85. I looked to both sides but traffic below was seemingly oblivious to our race. I also noticed for the first time that some runners with wave D bibs were passing me. 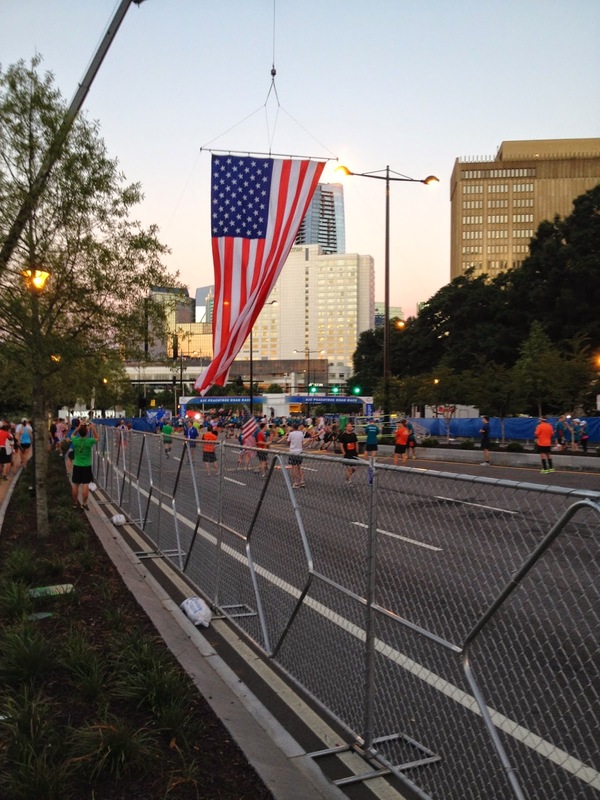 Looking ahead, there seemed to be a solid mass of runners heading uphill, as we entered midtown Atlanta, so any gaps from the beginning were completely closed by this point of the race. The landmarks of Rhodes Hall and the intersection with 17th Street came up fairly soon; only seven blocks to the turn onto 10th Street! I was slowing down again but was determined not to stop running, even as I passed a couple of walkers none too quickly. The median strip divided the street in parts of Midtown, and I decided to run to the right of the median, as the runners on the left side of the median were running quite a bit faster. This was a good decision, as the few walkers in this area stayed well to the right. Then, disaster struck once again, with that left shoelace! I had to work my way to the right side this time, and tied it down really tightly, then resumed my run. There was another fairly steep uphill as we approached the High Museum and the Woodruff Arts Center. Some bloggers claim that this is the high point and it's downhill from here, but in fact there are still a few more blocks uphill, although not the slope is not severe, except for people who have already run 4-3/4 miles to that point. I was able to take a glimpse at my phone shortly before reaching the mile 5 marker, and was delighted to see 42 minutes and some seconds. Finally I knew that I was truly on a good pace and might match or slightly beat my 10K personal record, if I could maintain or exceed a 10-minute per mile pace. 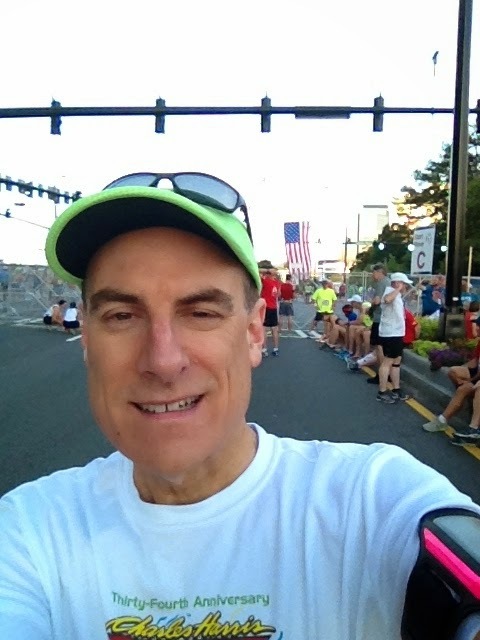 I completed mile 5 at 44:15, 9:55 for the fifth mile. Mile 6: Upon reaching 12th Street, I knew, finally, that it would be mostly downhill the rest of the way. I wasn't able to pick up speed at first, but after making a sweeping left turn onto 10th Street, the descent was perceptible. Upon passing Juniper Street, I was able to force myself to go a little faster, then we reached Piedmont Road. Three long blocks to go? I was so happy to see the green expanses of Piedmont Park to my left, and that spurred me to press even faster. We passed under the overhead photographers, and I raised my hands with two thumbs up as I approached their station. Although I didn't see a sign for the 6-mile mark, it would be at Argonne Street, which I crossed at 53:40, 9:25 for mile 6. Bonnie photographed me racing to the finish! The final 0.22 mile: I was determined to give the finish my best, and was going to use every last available calorie. But I couldn't see the finish line for the longest time! It wasn't until we turned downhill that I could see the blue bar marking the finish line, just past the Charles Allen gate to Piedmont Park. I expended every bit of energy into running as fast as I could, even passing a few runners that were flagging at the end. I raised my arms in victory as I crossed the finish line. My official time: 55:36, a few seconds slower than my PR in February, but nearly two minutes faster than the Memorial Day 10K in Marietta. And now I'm optimistic that I can do better when the weather cools again, and running easier courses such as the Eastside Beltline and Charles Harris 10K races. We continued jogging for about 100 feet along 10th Street to clear the finish area before turning into Piedmont Park, where volunteers gave us water, and then the official finisher's T-shirt. After checking in at the Atlanta Track Club, I saw a few friends from the Emory and Georgia Tech chemistry faculties. The Georgia Tech prof was wearing a sub-seeded runner bib, although I shouldn't have been surprised, as he won his 30-something age group in the Phidippides 5K back in December. Best of all, the Emory prof, who is a very good friend, had successfully recovered from an Achilles tendon injury while training for a marathon in March, had a pain-free race today, and finished just under 50 minutes! I then found three of the In-Training for Peachtree coachers, Curt, Kathie, and Chuck. The free food was grits from Waffle House (I was hoping for a breakfast burrito) so I skipped the food and accepted a cold Powerade. It took me a few minutes to find Bonnie and her parents but it was great to celebrate with them! We had lunch at Jason's Deli at a curbside table on 10th Street after watching Meb Keflezighi dash by on his quest to start as the last runner and pass 22,500 runners in a fundraiser for Kilometer Kids, a children's running support group sponsored by the Atlanta Track Club. Goals: To have a memorable race: Achieved! To finish in less than 60 minutes: Achieved! To challenge my personal record of 55:29 for the 10K distance: 55:36, I'll take it! Item to work on: tying my shoelaces in secure fashion!